The Wall-Mounted Cat Tree Dolomit XL Tofana is a luxurious, beautifully designed, wall mounted cat tree that will command centre stage in any home. With seven levels for your feline friends to relax, climb, and play. You can rest assured that they will have everything that they need to feel fully content and have the most puuuuuurect experience! The Wall-Mounted Cat Tree Dolomit XL Tofana is held together with several high-quality, durable, sisal poles. These are perfect for your feline friends to sharpen their claws and stretch their backs. If they are feeling a little bit snoozy, then there are plenty of platforms and beds for them to drift off into a peaceful slumber. As with all Kerbl products, you can be sure that the highest quality workmanship has gone into producing them and that you will have a product that will stand the test of time for many years. Standing at 185 cm, the Wall-Mounted Cat Tree Dolomit XL Tofana provides more than enough room for your feline friends to get all of the exercise they need, and the mental stimulation that is required, particularly if they are indoor cats. This product comes with easy to follow instructions. 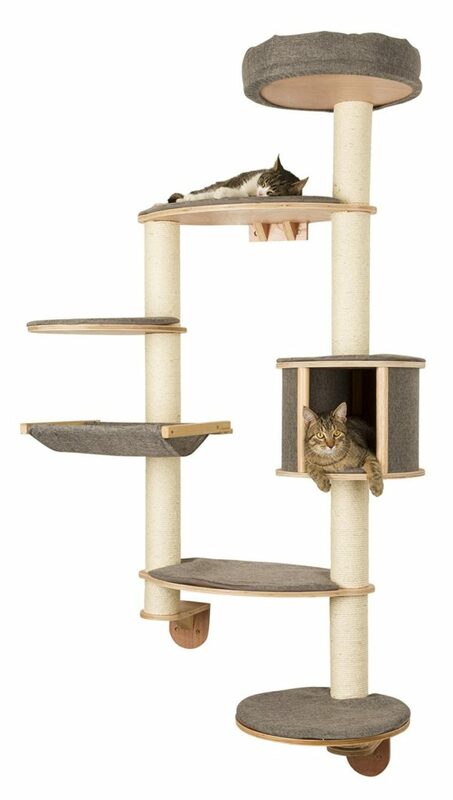 So, you do not need to be a DIY enthusiast to get this up as soon as possible and start reaping the rewards that this beautiful cat tree provides! Back in stock towards the end of April 2019 – Pre-Order Today! Very happy with this cat tree. It is not the easiest cat tree to get up and running although the instruction are relatively clear. We did mange to get it up after an hour or so and appears to be very strong and no movement or wobbling. This cat tree looks very modern on the wall and attaches to the wall very well without much effort. The finish on the wood looks great, but the pillows could be a bit thicker. Very high quality play centre. As mentioned in previous reviews, it does require a couple of people to attach it to the wall, but the quality is clear to see and appears to be very strong. Spoke to Jon about this cat tree and helped provide the additional information I needed. Delivery took 4 days and everything was in working order. A pleasant experience dealing with this company.